Catherine Getchell has served as the Director of Carnegie Mellon University’s Office of Disability Resources since 2016. In her role, she works with students with disabilities to develop accommodation plans, teaches and promotes students’ self-advocacy skills, and provides training and advocacy on disability and accessibility to all members of the CMU community. 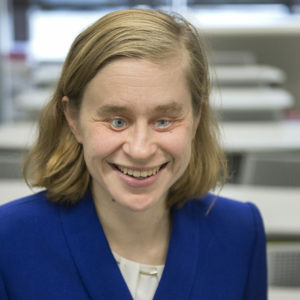 Prior to coming to CMU, she was a Vocational Rehabilitation Counselor and then District Administrator at the Pennsylvania Office of Vocational Rehabilitation for twelve years. She has a master’s degree in Rehabilitation Science from the University of Pittsburgh. Catherine has a passion for promoting independence, equal access, and de-stigmatization for people with disabilities. As a person with a disability herself, Catherine has personal familiarity with the stigma and bias often experienced by people with disabilities. In her spare time, Catherine enjoys playing the trumpet, kayaking, biking, cooking, and going on long walks with Miles, her Seeing Eye dog.